It can be uncomfortable to talk about race, racism and racial injustice, and yet engaging in this conversation is important. This workshop will use On Behalf of Our Children: Wisconsin’s Racial Disparities and the Call of the Gospel, a resource from the Wisconsin Council of Churches to begin to unpack the hidden power of race and God’s call to us in the midst of it. Thursday, Jan. 11, 9:30am-4pm at Good Shepherd Lutheran, 4141 Mormon Coulee Rd, La Crosse. Cost: $10, includes refreshments, lunch and program material. Register by emailing office@lacrosseareasynod.org, or calling 608.788.5000 by Jan. 8. Questions? Contact Pastor John Dumke at jfdumke@gmail.com or 630.675.8910. First Lutheran invites all women to join us in January for conversation and support. We’ll gather at Hackberry’s (above the food co-op in La Crosse) on Saturday, Jan. 13, at 9:30am. It’s a great way to get to know women in the congregation. Questions? Contact bridget@firstlu.org. First Lutheran Church wants to personally invite you to a special worship honoring and lifting up members of our congregation who are aged birth-three years old. When: January 14, at both worship services. Please join us for a time focused on honoring this age group and to receive a holding cross. A Stephen Minister is a good listener to a person in crisis, bringing Christ into the relationship. Come join us and see how Stephen Ministers make a difference in the church. 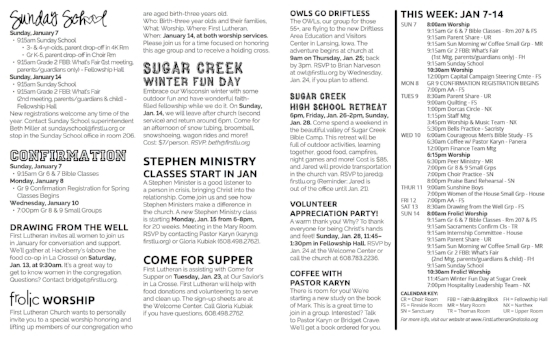 A new Stephen Ministry class is starting Monday, Jan. 15 from 6-8pm, for 20 weeks. Meeting in the Mary Room. RSVP by contacting Pastor Karyn (karyn@firstlu.org) or Gloria Kubiak (608.498.2762). First Lutheran is assisting with Come for Supper on Tuesday, Jan. 23, at Our Savior’s in La Crosse. First Lutheran will help with food donations and volunteering to serve and clean up. The sign-up sheets are at the Welcome Center. Call Gloria Kubiak if you have questions, 608.498.2762. The OWLs, our group for those 55+, are flying to the new Driftless Area Education and Visitors Center in Lansing, Iowa. The adventure begins at church at 9am on Thursday, Jan. 25; back by 3pm. RSVP to Brian Narveson at owl@firstlu.org by Wednesday, Jan. 24, if you plan to attend. 6pm, Friday, Jan. 26-2pm, Sunday, Jan. 28. Come spend a weekend in the beautiful valley of Sugar Creek Bible Camp. This retreat will be full of outdoor activities, learning together, good food, campfires, night games and more! Cost is $85, and Jared will provide transportation in the church van. RSVP to jared@firstlu.org (Reminder: Jared is out of the office until Jan. 21). A warm thank you! Why? To thank everyone for being Christ’s hands and feet! Sunday, Jan. 28, 11:45–1:30pm in Fellowship Hall. RSVP by Jan. 24 at the Welcome Center or call the church at 608.783.2236. There is room for you! We’re starting a new study on the book of Mark. This is a great time to join in a group. Interested? Talk to Pastor Karyn or Bridget Crave. We’ll get a book ordered for you. Join other adults for an afternoon of exploring, questioning and learning about your faith. Faith Alive University takes place Jan. 28 from 1–3:15pm, following the volunteer appreciation party. You will have the opportunity to attend two 1-hour classes: The Gospel According to Harry Potter, Bible 101, Comparative Religions, and Faith & Doubt. Childcare will be available. Register at 1stlu.org/faithaliveu. Before the After is a planning tool to be used by anyone, any age, to outline your wishes, prepare and organize pertinent documents and eliminate possible tough decisions for your loved ones. Plan your Before the After, ask questions of knowledgeable individuals, open communication with family or friends and coordinate all your information in one place. Tuesday, January 30, 6–8pm, in Fellowship Hall. More info: 1stlu.org/b4after. A baptism preparation session will be Saturday, February 3, at 10am in the narthex for anyone who is considering or has scheduled a baptism. To register or ask questions, contact the church office: 608.783.2236 / office@firstlu.org. For grades 3–5, on Friday, Feb. 9, 5:30–8:30pm, in Fellowship Hall. Why? To have fun and build faith-based relationships!!! Wear your most comfy pajamas and bring a sleeping bag and pillow to lounge on if you like. We’ll meet, eat, play a couple of games and settle in for a movie and popcorn. This event has always been a huge hit and everyone has a great time together!! Nominations needed! First Lutheran will elect two new members to the Vision & Leadership Team at the Annual Get-Together on February 10. Read the following ‘job’ description and consider who you could nominate for this ministry. POSITION: Member, Visioning and Leadership Team. Position Summary: As a servant to the ministry of First Lutheran Church and working in conjunction with pastoral leadership, is responsible for development of the congregation’s mission and vision. Develops short and long term strategies for ensuring the spiritual and physical health and wellness of the congregation. Provides support to staff and congregation members to equip each member with skills to grow in faith and their own personal ministry. With winter (finally) arriving, we have many guests in need of warm hats and gloves — we are especially short on more masculine styles. Please consider donating cold weather gear ASAP. Many of our guests walk to and from school, which means a lot of time out in the cold. Gently used winter coats are also welcome! Thank you for warming heads, hands and hearts with your generosity! The sign-up sheets for the 2018 flowers are on the bulletin board. If you would like to honor a loved one, check the bulletin board and sign up for an open week of your choice. You can also contact the church office to inquire about openings: office@firstlu.org / 608.783.2236.